Ultimate Guide to 28 Day Reset on a BUDGET! Healthy food has a reputation of being more expensive. If any of you have watched a food documentary like, “Super Size Me” or “Fed Up,” you know that fast-food and sugary foods are cheap. But! If you know how to effectively grocery shop and cook at home – not only will you save even more money, you’ll be saving your health too. Here are my tips and fave foods for staying healthy on a budget! Get accustomed to meal prepping! It is the answer to eating healthy on a budget. Buy in bulk, cook in bulk, and you’ll bring back SO MUCH MORE TIME into your life! So the Blogifam spent the last few months designing a pad to help you organize your groceries and your meals for the week. 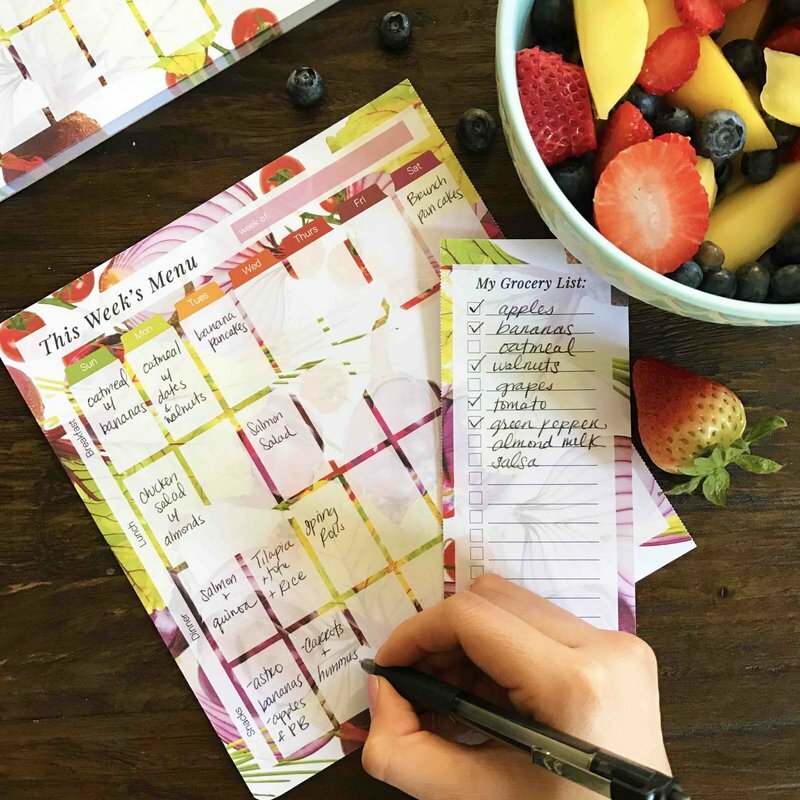 Feast your eyes on the first ever… Blogilates Meal Prep Pad! Plan out your meals for the week on the left and then write down what you need to buy on the right! The best part? The grocery list is already perforated so that you can tear it off and take it with you to the store! Also – try to buy IN SEASON fruits and veggies. You’ll save a lot of $ that way as they will be ON SALE! I like using my meal prep pad as a mouse pad too! Oh and do you notice the cool design in the background? It’s fruits and veggies! I love the color so much! So if you’re on the 28 Day Reset Challenge, I HIGHLY recommend that you get this Meal Prep Pad. It will help you a lot and it’ll last a whole year! Healthy, gluten-free carb that contains fiber and is slow-burning to keep you fuller longer. It also contains a little protein! As an alternative to rice, to bulk up salads and even as a breakfast porridge. Or, make it the star of your meal by adding a rich vinegar dressing, grilled veggies, dried fruit and nuts. There are 5 servings per 8-oz bag, making it about $1 per serving. If you toss with some greens, veggies and a little salad dressing, you could have a super filling meal for less than $4.00! Whether you choose black, pinto, re-fried, garbanzo or kidney beans, all contain slow burning carbs with a healthy dose of fiber for satiety. There are only about 12 net carbs (6 grams of fiber) and 6 grams of protein in 1/2 cup of pinto beans, making these great for vegans as a source of protein. Toss into salads, make soup, or even get on the black-bean brownie train and use them in desserts like blondies, cookies and brownies. There are 3.5 servings per 15-oz can, so that’s less than .60 cents per serving! Oats are a comfort food for a lot of people, which is a good thing, because they’re a healthy carb that keeps blood sugar stable. They contain fiber, folate, iron and magnesium and less than a gram of sugar per 1/2 cup. They also contain 7 grams of protein per serving! Use as a binder in meatloaf, for overnight oats, warmed like porridge, in smoothies, as a base for homemade protein bars and granola. Grind them in a blender to make homemade oat flour. Around 18 per 32 oz bag, making this superstar food only about .22 cents per serving! TIP #5: WANT PROTEIN PROTEIN? EAT LENTILS! These are another vegan favorite, but they should be an everybody favorite! Lentils are virtually hands-off to cook (simply boil in water or broth), and have a variety of uses. They’re hearty and full of fiber and protein. 1/4 cup contains 11 grams of protein and only 20 net carbs with 7 grams of fiber. These are a great non-meat source of protein that keeps blood sugar stable while providing many vitamins such as: iron, folate, magnesium and manganese. Most people enjoy boiling with veggies for a hearty soup, but you can add to salads, purée with tomatoes for a healthy dip, or make veggie patties. TIP #6: MUNCH AND MUNCH AND MUNCH ON POPCORN! If you find one of the healthy varieties with non-GMO ingredients like just corn, oil and salt, you’re in good shape to tame your salty/crunchy cravings without added junk or preservatives. Popcorn allows you to eat slowly and enjoy almost four cups as one serving! Most snack foods are gone in two bites! So, for under 50 calories, you can munch and munch without guilt. Popcorn contains about 12 net carbs and 3 grams of fiber per serving. As a snack food any time you’re thinking of grabbing a bag of chips or a candy bar. 3 3/4 cups per 4.4 oz bag, making this snack right around $1.00 per serving. These are a fine alternative to bread for those following gluten-free diets. They’re also a great stand in for other high-calorie crunchy snacks like crackers and chips. Most contain between 40-60 calories per cake, which is about half the calories of a slice of bread. There’s not a lot of fiber in these, and you want to find brands that are made just from brown rice and maybe a touch of salt. Make sure there’s no sneaky ingredients in there like sugar if you’re on the Reset! You’ll get about 8 carbs per rice cake, so stick to only 1-2. Slather with almond butter and a touch of sugar-free jam for a sweet treat, or spread with mustard and turkey for a crunchy sandwich! There are about 14 cakes per sleeve, making these about .15 cents per rice cake. TIP #8: NO TIME TO COOK? FILL UP ON A PROTEIN SHAKE. Before you say this seems expensive, check the serving size. Protein powders often step in as an entire meal, depending on the brand you buy. They contain all the protein of a chicken breast, meaning you’ll get all the essential amino acids you need to refuel, rebuild and recover after your workouts. Many brands also contain probiotics, enzymes, concentrated greens, some fiber and are easy for people to digest. Garden of Life Raw Organic Protein Powder has dozens of vitamins, 22 grams of protein, 2 net carbs, 3 grams of fiber, plus antioxidants and probiotics. Check around for the kind that works best for your body. Is it egg white, vegan, bone broth or whey? The price will vary with the type you select, and with the quality of ingredients. Blended up in shakes! Take a scoop of powder and blend with ice and liquid with 1/2 a banana, a few almonds and spinach and you have a powerhouse meal for under $3.00! You can also bake with most powders, making yummy treats like mug cakes. Most powders contain 20-22 servings per jug. You can find many brands between $20.00- $40.00, so just the powder alone is between $1.00-$2.00 per serving. There aren’t a lot of leaner ways to get muscle-building protein into your body than simple chicken breasts. You can do it with fish, but fish often costs more. Chicken is super versatile and can be prepped in bulk, so it’s a time saver too! Grilled and chopped up into salads, tossed into quinoa bowls, added to healthy burritos, in stir fry’s, baked with a simple sauce or tossed into a crock pot and shredded. This will depend on how you buy it, but you can get frozen chicken breasts in bulk from Costco, or smaller amounts of fresh chicken from the supermarket. You’ll pay anywhere from $1-3 per breast, depending on the size. Some breasts are 2-3 servings, and most of us only need 3-4 ounces, or the size of a deck of cards. Make sure you check the size/weight before cooking to ensure proper servings sizes. TIP #10: MISS PASTA? HAVE BLACK BEAN PASTA! You’ll never be able to tell that you’re not eating conventional pasta that’s loaded with carbs and gluten other than by the color of these uber nutritious noodles. They are perfect for gluten-free and vegan lifestyles because the only ingredient is…. black beans! It’s magical how they turn a bean into a delicious noodle with a whopping 25 grams of protein per 2-oz serving! They also contain 11g of fiber, which makes these really filling and great for those following a lower carb regimen. These contain about 30 grams fewer carbs than regular pasta per serving! You cannot find them in all stores, but they’re widely available online. Just as you’d use pasta! Add a red sauce for a meal that costs less than $2! Or, make a Thai peanut sauce and add broccoli and green onions. You can also chill them and add to salads or stir fry’s. Servings: 4 per box, so about .86 cents per serving. Not many things satisfy as well as a spoonful of nut butter. Other varieties, such as almond or cashew butter are slightly more expensive, but also make the list because of their amazing benefits. Nuts and nut butters contain healthy fats that help keep you full. Low in carbs with moderate protein, nut butters spread onto almost anything, making whatever it is infinitely better. Nut butters do contain fat, which is why it’s important to stick to serving sizes by measuring by the tablespoon. One serving (two tablespoons) of nut butters clock in around 190 calories or so, which is why it’s great to pair it with low calorie things like celery, apples and rice cakes. If you like to use for toast or as a drizzle for oats, be mindful of how much you use. In shakes, by the spoonful to tackle cravings, as the base for a salad dressing, in overnight oats and with celery or apples with raisins for ants on a log. 14 per 16-oz jar, making this childhood snack only .35 cents per 2 tablespoons! TIP #12: EAT APPLES, PEARS, ORANGES & BANANAS! I probably don’t need to say much about fruit; it’s nature’s candy, full of vitamins, antioxidants and water. Fruit tames your sweet tooth cravings and leaves you satisfied thanks to fabulous fiber. It’s also portable! These fruits tend to cost less than fresh berries, and last much longer, so they’re budget-friendly. Straight up, in smoothies, in a fruit salad, as toppings, with nut butter. A huge bag of Clementines costs as little as $3.99, making these cuties around .20 cents each. Bananas can be found for as little as a quarter, and apples cost less than a dollar. TIP #13: REPLACE REGULAR POTATOES WITH SWEET POTATOES! This is a carb from the earth that everyone should be eating! Sweet potatoes have beta carotene, vitamins A, C, B-2, B-6, manganese and more, as well as fiber. They’re a slow burning carb so they won’t spike your blood sugar. They also last a long time in a cool, dark place, so you can buy a big bag for pretty cheap and have it last you a couple weeks. Baked, mashed, sliced and baked as fries, spiraled as noodles, sliced and baked as chips, cubed, and tossed into salads, as a thickener in soups, in pancakes, and even in desserts! You can generally find a medium-sized sweet potato for about $1. Packed with vitamins and antioxidants, lettuce and spinach can serve as a base for all kinds of cold salads, and spinach and kale can be sautéed into just about anything to add nutrients and fiber with few calories. Spinach and kale can be added to shakes (you won’t taste it! ), sautéed, added to soups and egg dishes, and all three can be the base of cold salads. 4-6 per bunch, making each serving about .50 cents. This might be one of the most expensive items on the list, but this little beauty is well-worth it. Avocados contain healthy fat and even a little protein. They have more potassium than a banana, and tons of vitamins, including: C, E, K, B-6, and folate. Guacamole, smashed into tuna salad or a vegan garbanzo bean salad (in place of mayo), sliced in sandwiches, with eggs, in baking, in vegan chocolate pudding or as a simple snack with sea salt. So much versatility! 2-4 per avocado, making this one about .50 cents per serving. Tuna is a lean protein, and because it’s in a can and needs no refrigeration, it’s great for on-the-go, something you can’t say for fresh fish. It’s a meal on its own, or you can add to salads, or mix with avocado, mustard or a little mayo for a richer flavor with some healthy fat. You get about 14 grams of protein for just 2 ounces of tuna with zero carbs and 1 gram of fat. That’s super cool because it means that you can add a healthy fat of your choice, like mayo, olives or avocado! In Mediterranean salads, mashed with avocado, lemon juice and garbanzo beans, on rice cakes or for dipping cucumbers. 2 per can, so about $1 per serving. TIP #17: EAT YOUR EGGS! One egg clocks in at 70 calories with 6 grams of protein (4 of which come from just the white). The yolk contains vitamins and minerals such as choline, B-12, iron and vitamin D. There are about 5 grams of fat in an egg, which helps with satiety. Poached, scrambled, sunny side up, hard-boiled, in egg salad, added to salads, in baking, in breakfast burritos. If you find them on sale, they can be as low as .20 cents each! Chia seeds contain 1/3 of your daily fiber in just 2 tablespoons! Fiber aids in cholesterol reduction, and helps keep you full. A great source of vegan protein and omegas, these tiny little seeds are a nutritional powerhouse. They contain iron, which helps maintain energy and aids in red blood cell production. One ounce of chia seeds delivers 244 milligrams of phosphorus; 35% of what adults need each day to help maintain bone mass. Chia seeds also contain zinc for a healthy immune system, calcium for strong bones and niacin to help keep your skin and nerves healthy. Added to oatmeal and shakes, or made into chia pudding, added to salad dressings to thicken them, or tossed right into salads for crunch. 28 per 12-ounce bag, or about .23 cents per tablespoon. Frozen fruits and vegetables mean that you won’t be wasting money on fresh foods you can’t finish before they spoil. They’re also locked in at peak freshness, preserving their nutrients. Simply pull what you need for a recipe and keep the rest frozen! You’ll be getting loads of fiber and antioxidants with tons of flavor and few calories. Frozen fruits can go straight into shakes, be made into jam, tossed onto oatmeal, cottage cheese or yogurt, or sautéed as dessert. Frozen veggies just need to be reheated to round out any meal. There are many varieties of mixed veggies too, like succotash, grilled vegetable medleys and a collection of stir-fry veggies. Anywhere from 2-6, so you might get a serving for around $1. Almonds contain healthy fat, a bit of protein and fiber, making them the perfect portable snack. Yes, almonds are high in fat, but it’s the good kind of monounsaturated fats your body needs. 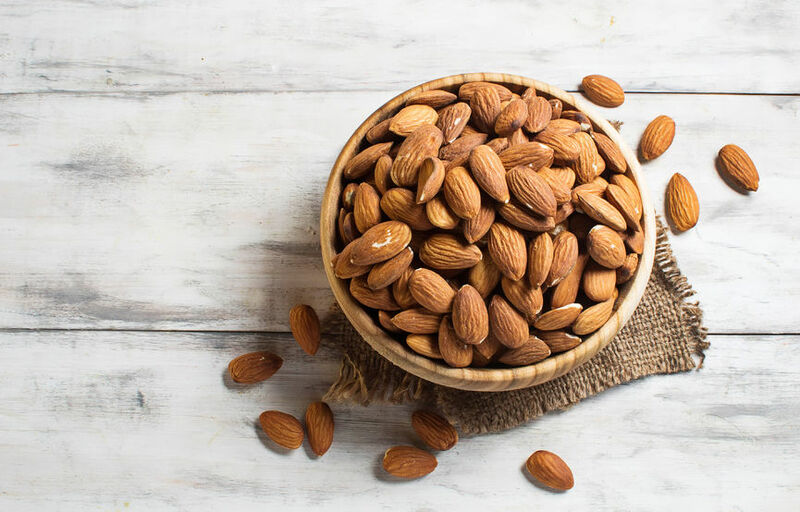 Almonds are packed with essential nutrients, including magnesium, potassium, and vitamin E, all of which attack high cholesterol and prevent heart disease. They’re also high in calcium. Make homemade almond milk, toss into salads, use as a Paleo coating for chicken, add to oats or yogurt, make homemade nut butter, or just use as snacks. There are 8 or more servings per bag, so per handful, these cost about .87 cents. TIP #21: GET FLAVOR FROM SALSA! Packed with flavor—and heat, if you like spice—salsa and hot sauce add tons of flavor for little cost. Just a splash gives you the essence of tomatillos, cayenne, garlic, peppers, tomatoes and more! It’s also healthy, packing in antioxidants and vitamins, and it’s super versatile. It’s also very low calorie, so feel free to dump it on! Add to omelets, chicken, guacamole, as a dip for veggies, as a salad dressing and as a base for ground turkey dishes. About 15 (2 tablespoons per serving), or .23 cents per serving. Who doesn’t love the creamy, bean-y flavor of hummus?! It’s the perfect dip for veggies, containing plant-based protein, healthy carbs and a touch of fat. It contains all the macro-nutrients in one bite, making it a great snack food. It’s easy to want to eat the entire tub, so stick to 1-2 servings! There are many different flavors on the market now, from jalapeno, to beet to Thai coconut, so explore all the fun flavor profiles out there, because you’ll never get bored. With raw veggies or on rice cakes, as a base for salad dressing, smeared on chicken, then baked, or in Mediterranean bowls with quinoa and cucumbers. About 11 (2 tablespoons per serving), making this punch of flavor only .30 cents or so. TIP #23: DRINK ALMOND MILK! Whether you choose coconut, cashew or almond milk, it’s a good idea to ditch cow’s milk. Most people cannot tolerate dairy without experiencing stomach cramps, bloating and gas, as they lack the enzyme required to break down lactose. Substituting with a nut milk provides nearly double the calcium of cow’s milk, with fewer calories and no stomach distress. Nut milks allow your smoothies to remain thick and creamy, for as little as 25 calories per cup! While there’s little to no protein, you’ll get little fat, no sugar and zero net carbs. And guess what?! Making any of these milks yourself is SO easy! Coconut milk couldn’t be faster or easier! Blend up 4 cups of warm water with 2 cups of shredded unsweetened coconut with 1/2 teaspoon of vanilla extract. Strain through a nut bag. Store in a glass Mason jar for up to 3 days. That’s it! In smoothies, baking, soups, with granola or straight from a glass. Note: Prices sourced through Amazon Fresh. But like I said above, take advantage of in-season produce sales and you will save A LOT. Meal prepping is so helpful! I love buying sweet potatoes for breakfast in bulk or making giant vegetable and lentil soups for dinner! Love all the ideas! I’m planning on trying the 28 day reset in February so I’m going to try and get some of these items when I get my next paycheck. I’ve bought a lot of these healthy foods before but without an actual food prep/meal plan the food just sits there going bad… I’ve never even tried to make or follow a meal plan or prep any meals ahead of time so not sure how this will go. Half the stuff you cannot find where I’m from, and the other half is really expensive. Me and my husband earn, together, $2000 a month, and that’s a high salary in our country. A kilo of sweet potatoes is $2-$3, and a kilo of regular potatoes is $0.3. Quinoa is $5-$6 per bag, regular rice, or even brown, is $1.5-$2 per bag. Eating cheap, clean and healthy is not as easy for some, even though we try to buy local and in season veggies. Great ideas, but before you poo-poo someone who says eating healthy is more expensive, remember that we are all dealing with different locations, incomes and socio-economic issues like living in a food desert. Those factors are not in someone’s head and it’s not a one size fits all. I myself live in Zimbabwe and some of these items are very expensive here. Exactly, “some” of these items. The point is that she suggests types of items you can use. Where I live there is no kale, so I use cabbage or other leafy greens. I’m allergic to corn, so I eat paprika instead etc. A lot of places have different things that are cheap but eating healthy IS not expensive no matter where you live unless you wanna buy all the hyped superfoods and whatsnot. Just wanted to also mention that I’m a student (with no parent support) and I have less than 150 euro every month left after I pay my bills, room fees and so on. It’s considered poverty here but I personally (minus my “apartment” size) don’t miss anything because I can buy pretty much any food I want if I buy simple foods. I absolutely agree with you Steph and not just that. I can’t eat apples ’cause they make me more hungry, and I don’t think peanutbutter is healthy because of too much fat in it, no matter how much I love peanut butter. But I won’t reject all of this examples (I suppose it’s just that – examples of what you can use instead) and there’s so many food we could use instead of these. I’m Croatian (Europe) and we do have a lot of these food and it’s expensive out of season, so I choose seasonable food. And I won’t miss a thing and I’ll eat healthy. So, I do agree with you but I choose to adjust Blogilates examples of meals and seasonable food here – in Croatia. Food costs DOUBLE this in Hawai’i ? Hey Cassey! I’m a college student, so the budget is tight, but I’m always learning! I do have some qualms. I’m allergic to all nuts, sensitive to excess amounts of soy/coconut, and allergic to sesame seeds (think tahini, hummus…). It would be amazing if you could advocate for healthy recipes that are also allergy-friendly, but I understand that it’s difficult! I’m also in the healthcare field, so I beg you to research more before advocating clearing your body of toxins (hellooooo liver), and kinda bashing on cow’s milk. Every food out there will have a pro and con right alongside it, and I suppose it’s up to individuals to decide what makes them feel good and what doesn’t! As such, the 28-reset is a good start to open the conversation between yourself and your body to see what kinds of things might upset your digestive system and hey, cutting sugar is never a horrible thing! Super proud of you and all your progress; I remember first finding your beginners pilates video early on in high school and showing it to all my friends :) Keep up the inspiration, and good luck!!!!! I’m a med student and cow’s milk is terrible for you. Isn’t it beautifully ironic THIS comes out 23 days into the cleanse and $$$ dollars later?? ? I love most of these suggestions–just a few of them I can’t eat since I’m paleo. Also! Have you had a chance to try MACADAMIA NUT MILK?! It’s insane that that’s a thing and I’m dying to try it, I’ve only seen it in stores once and it costed like 6 dollars for 1L! So yeah I agree with other posts and I’ve posted before but the whole cheap clean eats is clean eating but not cheap! Great Cassey you can get $4 a bag quinoa – I’m lucky if I can bulk wholesale purchase and get it to $8 .. Usually $9-10. How about just write about clean eating and not call it cheap! If people live frugally then they already know how to make the most of their budget. We need to value our food, expensive food like quinoa has a high value for ourselves so it’s a choice to go with it or not .. When I buy quinoa I can’t buy anything else much so it’s quinoa and then the most budget white rice for two weeks – but I know why Ivw made that choice and I’m happy and healthy for it. Luckily I only eat 1/3c so it lasts me but purleeeze I don’t need someone telling me it’s a cheap healthy option and saying it’s only $4!! Unfortunately where I live are most of the listed items very expensive – almond milk, peanuts butter, avocado, chicken breats,… As a college student I have pretty tight budget so it hard for me to eat completely clean. I also have a limited space for storing my food (I live with 3 other students in a small flat), so cooking ahead of time and storing it in a fridge or freezer is also out of question :/ But at least I try not to eat at fast foods (well I don´t find it tasty anyway) and I am avoiding sweets and sugar and instead I try to eat more vegetables and fruits I can afford..
-Oatmeal with dried fruit, almonds and honey; or with blueberries, banana, almond and honey. really just whatever I feel like adding. I also usually get some frozen fish/chicken breast that I can just throw in the oven or use to make crock pot meals. All of these are fairly cheap and don’t take up too much space. I usually shop in the perimeter of the store, buying fresh produce and meats. I would rather invest my money there than on the unhealthy snacks I know I’ll binge-eat when I’m up late studying. I had the same problem, but even on my limited college student budget I still lost almost 20 lbs by eating clean and working out. You got this! Go to dining halls and choose the salad bar or grilled chicken and veggies, buy quick stuff like oats and a couple fruits a week. If i can do it with 7 roommates in a dorm, I’m positive you can with 3. Loved this. So much information. I am great at doing my workouts. But always fail on food. Thank you Cassey. It’s cool, but not when in your country it’s winter and it’s the real winter, not LA kind of winter. So we don’t have any season fruits and vegetables, they actually cost more right now than ever, because it’s all imported. And also there are no cheap almond milk, no cheap almonds, no cheap peanut butter. And I don’t even know where to buy chia seed and sweet potatoes and how much they will cost. I’m actually very sad, because I can’t do 28 day reset on my budget, because I either end up spending too much or eating the same food every day which I will absolutely hate. I know, I’m currently living in England and fruits and vegetables are quite expensive here. But lately i’ve been able to find disccounts on certain things so i buy a bunch, cook everything and divide it into containers so i can freeze the meals I am not going to be eating right away. These way is the only I’ve found that helps a little bit more with my budget. I only cook for myself, so I end up spending around 30 or 35 pounds on food instead of over 50 when I first moved in here. Yeah, I had bought the reset but after the first week I gave it up. It was so much work (5 different meals every day, there really is no BULK prep) and SOOOOO expensive. In Canada right now, the “cheap” options are really not cheap at all. I usually eat pretty well (lots of fresh, healthy items) and have a decent budget for food, but the reset cost more than double. I had bought the second week before I knew I would be quitting and it was really not much cheaper. I’m glad I have the recipes, but I do regret purchasing the plan. If your country isn’t particularly able to grow winter staple crops, I’d definitely lean heavily on the frozen vegetable options until seasonally appropriate stuff comes back into stores. Even though I live in the US with great access to year round crops (that shouldn’t be year round really) I try to eat seasonally when buying fresh. Frozen veggies are generally picked at peak ripeness, which often means the best level of nutrition. I believe the methods of freezing these days also tends to preserve the nutrition at a fairly high percentage, which is nice. It does limit the types of dishes I make to more stew or slow cooker based recipes. So true. I’m from Russia and such things as chia, almond milk and nuts in general are like luxury treats here. The only cheap fruit right now are apples and bananas. I buy frozen berries year round, because the quality is really poor even when it’s summer. And I found like one place where you can buy sweet potatoes but they’re so expensive it’s unbeliveable. Buying frozen is your best and cheapest option. Get creative and look up recipes. Anyone can do anything, it just depends on your will power and how much you want it. If you want it, you will find a way. Hey, Olga, the same in my country, harsh winter with all-day minus temperatures. All “healthy” items are way expensive for an average budget (the average monthly salary being apprx 300$). Almond milk 500ml is like 6$-12$ (depends on the brand and all nut milks are so expensive here! ), avocado (which I love) is 7-10$, the same goes for sweet potato since they are both imports, and I can’t eat eggs and beans (doctor’s orders). However, chia seeds (5$ for a small bag of 175g) can be found in better supermarkets and health-food shops. Just replace or eliminate some items, there are fresh produce options at the green markets.